What's Hot? What's Trending? 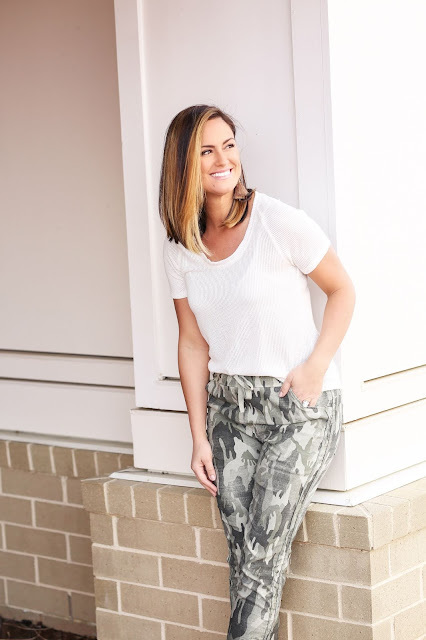 LauRen is a trendy Mommy Blogger that loves Fashion - Food - Family - Fun! It's all the F-words a Lady should know! From her personal struggles being a first time mom to products she can't live without, you can laugh, cry and SHOP with this little fashionista! So it's official! We've closed on the new house! However, we still haven't sold our old one yet. Meh! Thus, most of my time has been focused on what I can do to appeal to buyers in a super-saturated market, which is why I have been so MIA lately. After brokers lunches and multiple open houses where visitors provide feedback, I feel like I am pretty much an expert home stager at this point! When we put our house on the market 30 days ago I was just trying to get it listed quickly in hopes that getting it out there would sell it. How wrong I was! Looking back at our MLS photos I now realize that I could have done much more to make our home a clean slate for buyers to see their own lives unfold here (not ours). Of course, when I first listed our home I knew I needed to take down all of our family photos and make sure the house was immaculate, but I failed to realize that our wine collection and personal items were clouding buyers attention to the actual house! After receiving feedback (which I was offended by at first) I decided to take the constructive criticism to heart and "de-clutter" our house. Now, luckily I have a new home to move things into but I've learned some people consider putting their things into a pod or storage unit until they sell their homes. Some of you might be wondering what "de-cluttering" consist of? Well, let me tell you when I do something... I do it big! Our home currently shows like a model house. I've removed all unnecessary furniture to make the rooms feel as big as possible. I've also taken down all of our wine and cleared our bar tops in the bar room and the kitchen. I've cleared out 50% of our hanging clothes in the closets to make them feel as large as they can and I've taken EVERYTHING off of our built-in bookshelves. I am hoping and praying that this will help sell our home soon. I am even going as far as having our MLS photos retaken to spotlight our new space. I'll keep you posted! In the meantime, I wanted to share with you my new favorite jumpsuit! This cotton onesie is from Express and was designed by Fashion Blogger and former Miss Universe Olivia Culpo. It sells at a great price point and it is only one piece of her collection! We Accidentally Bought A House! Dallas and I have been "talking" about moving for at least a year, but clearly, we were in no real rush. In fact, in a years time, we had only seriously looked at 3 homes and our current house wasn't even on the market yet. Originally we thought we wanted to stay inside the I-485 loop. We loved the area we were in and wanted to stay close while finding a little more room. Then within the last month, we had decided to open our housing search to explore a little farther south and include Ballantyne. BINGO! I immediately started to see homes that I was interested in, so I set up a "scouting" day with our realtor Danielle and Dallas. "Let's just go check a couple out." Famous last words. I fell in love with a newly renovated cul-de-sac home right across from the golf course! After months and months of looking for a unicorn, we would all get what we wanted out of a home. Dallas was very adamant about being inside a community (for baby Cashton), he also had hopes of a golf course and I wanted an open floor plan with vault ceilings (and of course a couple more bedrooms). This house had everything we wanted and more, but were we really ready to pull the trigger? After talking it over Dallas and I decided that we weren't going to get into a bidding war over this house. There were a couple other families looking at the house as well and they had planned on putting offers in too. We chose to put in one offer that we thought was fair and call it a day. We could sleep at night knowing, if it's meant to be, it will be. Within two hours we received a call from our realtor exclaiming "Congratulations! You got the house!" "WHAT?!?! Really? Oh $h*t! I guess it was meant to be! So needless to say we spent the next two weeks scrambling to get our house ready to throw on the market... and here we are. We JUST listed our current house, and have an open house scheduled for this coming weekend. Wish us luck. In the meantime, enjoy this weather and this flowy spring transitional look. 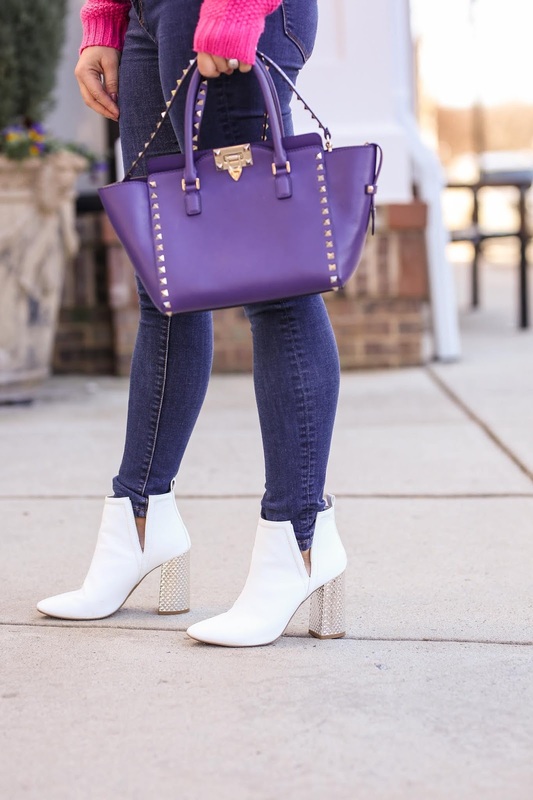 I scored this blouse and necklace from Apricot Lane in Stone Crest and I paired them with a semi-distressed white denim jean and my favorite Kristin Cavallari booties! I was so looking forward to my first time at Beech Mountain to go skiing for their annual 80's weekend. Our whole show was going to hit the slopes and host an 80's costume party at the resort's ski lounge. The weekend started off GREAT! Our Aupair, Elena and I made the 2.5 hour drive up whiney roads into the gloomy abyss. Unfortunately, the weather was being less than cooperative. Ski conditions weren't great since it was warm and rainy, but we were going to party anyway! Beech Mountain was nice enough to set our whole show up in one giant house for the weekend! As soon as we all arrived, there was fun to be had! A quick dip in the hot tub and a slice of pizza was the prelude for the evening. We all got ready in our BEST 80's ensembles and headed out for the night. Hosting the resort's party was a ton of fun and everyone really brought their A-game when it came to costumes. We saw, Ghostbusters and Joan Jet, Don Johnson and Hulk Hogan, but the first place award for the night went to Cheech and Chong! The night seemed to go off without a hitch... until now. After making it back to the house everyone took another quick dip in the jacuzzi and headed to bed. That is when all hell broke loose for me. I closed my eyes at 1:45am and not long after I was violently awakened by the sudden urge to use the restroom and puke at the same time! Now I know what you're thinking. LauRen, you probably just had too much to drink. I had 2 drinks all night! This was not the spins! This was something awful... something different and I proceeded to spend the next 7 hours unable to hold anything down. Ironically when I called my husband back home, he had been dealing with the same ailments. We BOTH had the stomach flu in two different cities. He urged me to come home ASAP as he was feeling the same way I was. He had been watching Cashton all weekend and was afraid to be around him and give him the flu too. So Elena and I got into the car and made the horrific drive back to Charlotte. As you can imagine driving almost 3 hours puking into a plastic bag is no fun! When we arrived back home Elena became the real MVP! She took Cash and let Dallas and I quarantine ourselves in our bedroom until the vomiting passed and we could sleep off the shakes. All in all, I guess you could say, feeling a little "green" left me inspired to share this camo look with all of you! The earrings, pants and white waffle tee shirt are from Fabrik Birkdale. 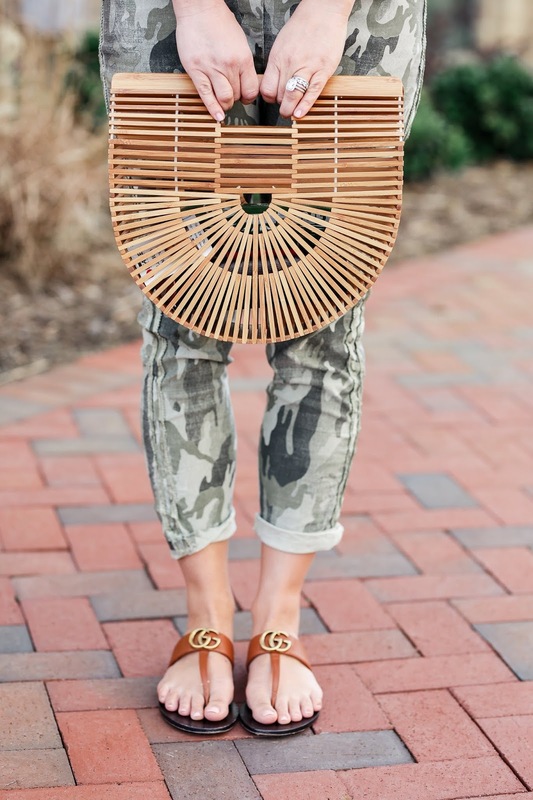 I paired them with my Gucci flip flops since the weather is a little warmer today and this bamboo bag from Red Dress Boutique. Enjoy! Let's be honest... everyone has family members that they consider a little cray cray. Well, that's pretty much my whole Pittsburgh family and last weekend I got to spend 72 hours in the "Burgh" with those crazies. It's not often we get the opportunity to all be in the same place at the same time but this occasion was special. My Aunt Angela was getting married, so Friday morning after the show, I hopped on a quick one hour flight to the city of bridges and landed in a blanket of white. It had been snowing for 2 days and continued to dump buckets of snow on my car as I raced across town to get to the courthouse to watch my Aunt and her new husband Mike tie the knot in front of their family and friends. Saturday afternoon they celebrated their love with a reception at the most beautiful restaurant on Mount Washington, The LaMont. Their old world glam and spectacular view of the city skyline was the perfect backdrop for this special occasion. There was just one problem ... this was a "dry" wedding. WHAT?!?! Of course, that wasn't going to fly with me. I didn't come to Pittsburgh, Pennsylvania not to have a drink in this stunning restaurant! So I did the only logical thing and I struck up an agreement with the bartender. He would open the bar (for only me and my siblings) and we would keep it quiet and take care of him at the end of the event. DEAL! Let me just say if you were in Downtown Pittsburgh the night of February 2nd, I apologize because we are not a quiet crew! Our little tribe headed to Sing Sing Piano Bar, where we did just that. Sang the night away! I know it's January 23rd, but it feels like New Years Day for our family! It's a new start. A new adventure. A new beginning. As you may have heard on our radio show, we have decided to throw caution to the wind and hire an Aupair! You may be asking yourself, "What exactly is an Aupair? "An Aupair is a young person from another country who lives with you and helps with childcare responsibilities in exchange for room and board. The reason I say we threw "caution to the wind" is that, before your Aupair arrives at your home in the US, you have never officially met face to face! Sure you have Skyped a million times and asked eight thousand get to know you questions, but you never REALLY know how someone will fit into your family until you cohabitate together. I can't begin to tell you all the things going through my head Friday afternoon as I drove to Charlotte Douglas International airport to pick up Elena. My palms were sweaty, my mind raced, and my heart fluttered. I couldn't place what I was feeling. As I walked into baggage claim holding my "Welcome Elena" sign and matching balloons, I was greeted by a thin blonde Italian girl with a warm smile. She gave me a huge hug and almost immediately my nerves subsided and transformed into excitement. On our drive home, Elena and I caught up over her week spent in NYC at Aupair training school where she was emergency and CPR certified while learning about life in the US. Once Elena settled into our home we introduced her to baby Cash. He was instantly intrigued by her. This was especially relieving since Cashton doesn't always take to new people. As the weekend continued on, Cash seemed to favor Elena. They chased each other, colored and watched cartoons together. Elena graciously jumped into her responsibilities as our new Aupair. She was eager to learn feeding and bathtime routines and even cooked for our family Sunday night. After a weekend of bonding with our family, I am confidently hopeful that Elena will love Cash and life here in the US. I know things will not always be easy as there will be a learning curve as well as times Elena will feel homesick but we will try to work through things together, as a family. Now that you have heard the tale of our weekend, here are the details to a fun look to get you through the week! I have received many messages about this pink fringed sweater from Vici and I've thoughtfully paired this vibrant look with a pair of dark skinny jeans and white booties. To polish off this ensemble I went with a pair of earrings from Fabrik Birkdale and my favorite Valentino bag. You know I try to be a positive person in life. I pray, I make time for my family and I try to hustle when it comes to my business. I believe (as cliche as it may sound) that you get out of life what you put in. However, as balanced as I try to be, it REALLY irks me when people try to take advantage of a situation. Two Friday's ago I was headed home from a client meeting on 77 South, when I watched a bolt fall off a hauler truck and hit my window. I looked up at my windshield to assess the damage and realized not only was my front windshield shattered in the upper passenger side window but that the bolt was still laying on the hood of the Stormtrooper. My eyes immediately refocused on the hauler truck it had fallen from and I proceeded to flag down the driver. As we pulled off the highway I took a photo of the bolt still laying on the jeep. When we stopped I explained to the driver that it had fallen from the top of his tall tailgate and returned the bolt to him. I also at that point asked for his insurance information and to speak to the owner of the company. I spoke to Andre, the owner of the Excavating & Hauling company on the phone and he assured me that we would rectify the situation. However, after weeks of getting the run around from the company and their insurance, it became painfully obvious to me that my windshield was not going to get fixed... at least not by them. After coming to terms with what goes around comes around, I've decided to let karma work it's self out and get the window fixed myself. I mean who has time to sit around and wait on dishonest people? I've got blogs to write. Thus, to take my mind off the vile words I could name call (can you tell I'm really hanging on to this one?) I've decided to share this perfect spring transition look with all of you! I'm freeing my mind with this adorable Free People embroidered dress and blush booties from Chinese Laundry. 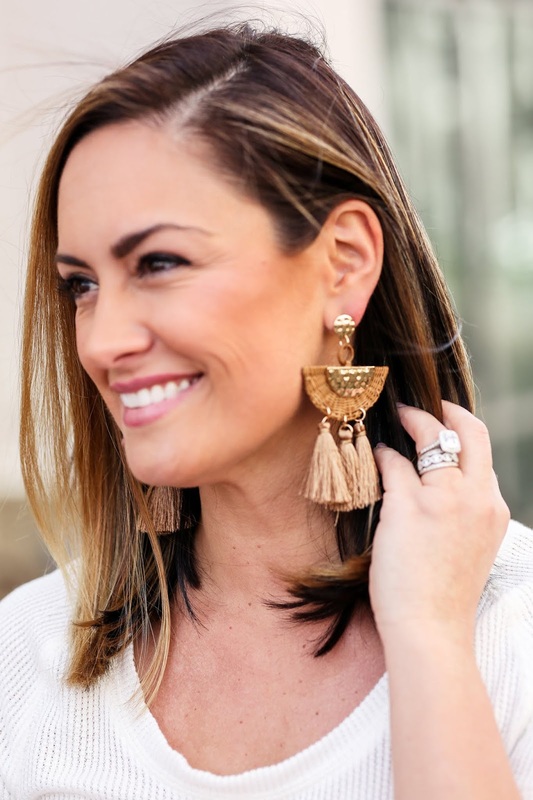 I chose to pair this look with my favorite Page 6 fringe earrings. I get so many compliments anytime I brake them out. Plus, who doesn't love a great bag to complete a pretty seasonal look? Happy New Year Friends! I can honestly say I have never been happier to wave goodbye to a year. 2018 was a tough year for my family and we are hoping for things to get off to a great start in 2019! This will be the year of focus for me. My long term goals this year are to focus on my family and my radio career. You hear stories all the time about how challenging it can be to balance both, and as a working Mom, I can attest to that! I have always been a big believer in vision boards and I am working on mine this week to include growing our radio family and putting even more resources into baby Cash's speech in 2019. Vision boards have always helped me keep sight of the things I've wanted to achieve and keep them fresh in my mind. It is so easy to get caught up in life and distracted by drama. You know what they say? "Out of sight. Out of Mind." Vision boards help me visually see what I need to keep myself motivated! Of course, also included on my vision board this year as cute looks for the young, busy Mom on the go! I love this business casual inspired blazer from Nordstrom and Free people waffle thermal. I kept this look leaning more casual with a pair of destressed black jeans and leopard flat mules. Add a great necklace and my signature hoop earrings and I am ready to take on the world in 2019! I hope you are too! Happy New Year! 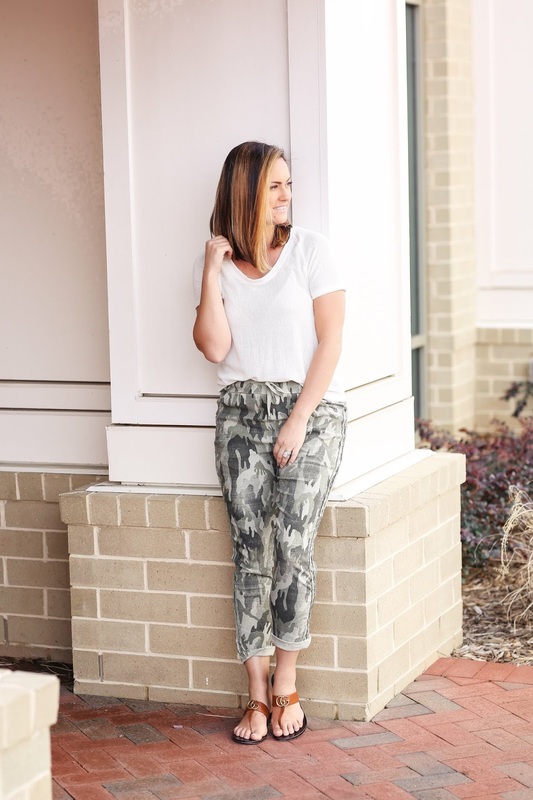 LauRen is a trendy mom with a flare for fashion and all things fun! She is Co-host of The Maney Roy & LauRen Morning show on Kiss 95.1 in Charlotte, and is a former NFL & NBA dancer. She was also Miss Pennsylvania USA 2008 and Top 5 at Miss USA! © 2015 All Of The F-Words. Jolie Template designed by Georgia Lou Studios All rights reserved.